We eventually emerged from our tent late this morning when the rain had stopped, and found we were alone on the campsite. The Range Rover had gone, the herberts with the brazier had gone, leaving only a scorched patch where it had been, and piles of charcoal in the hedge behind their pitch. I’d made a decision in the night, aided by the Sleep Fairies, to abandon the plan to go home via Oxford, but to head east instead on a direct line to Bury St Edmunds. The Oxford-Cambridge-Bury Sustrans route could wait till another time. The Sleep Fairies had also magicked up a suitable looking campsite near Warwick, that I swear wasn’t showing on my Camping and Caravanning Club app the night before. I rang to book, and the owner said the facilities were ‘very basic’. “I just need a toilet and drinking water” said I. “It’s an outside toilet but you’re welcome to come” he replied. 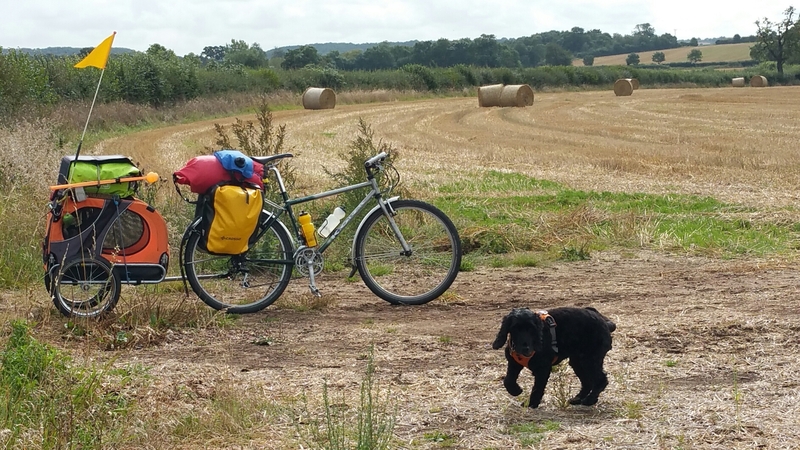 So we set off through the rolling Warwickshire countryside, on quiet lanes by old-world farms and cottages and streams and fields of stubble and of freshly ploughed deep brown soil. What exactly is an outside toilet, I wondered. Would it have a roof? Walls even? We passed a side road sign that read ‘Ford. Impassable at ALL times’, and thinking about the definition of ‘ford’ took my mind off the toilet situation. 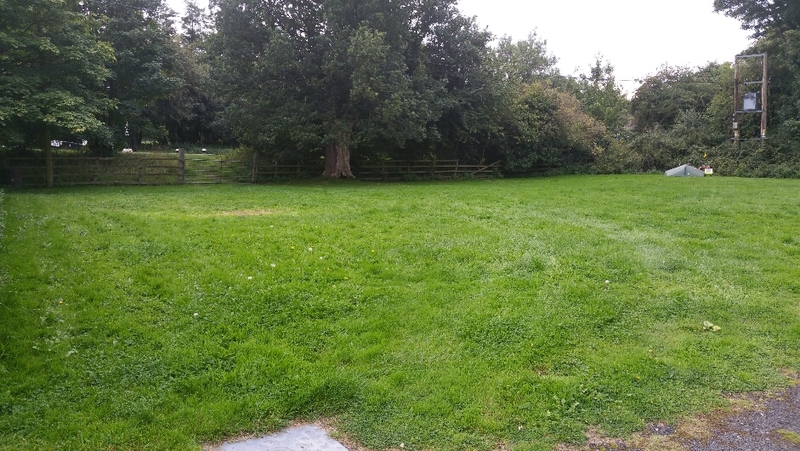 The campsite is a small grassy area between a busy road and the Grand Union canal. The toilet is on the side of the farm house, small but fine with roof, walls, door. There’s a light but no basin. Good job I had a shower yesterday. Raisin and I went for a stroll up the tow path and came across a lock, then another and another until suddenly there was a great flight of them before us. 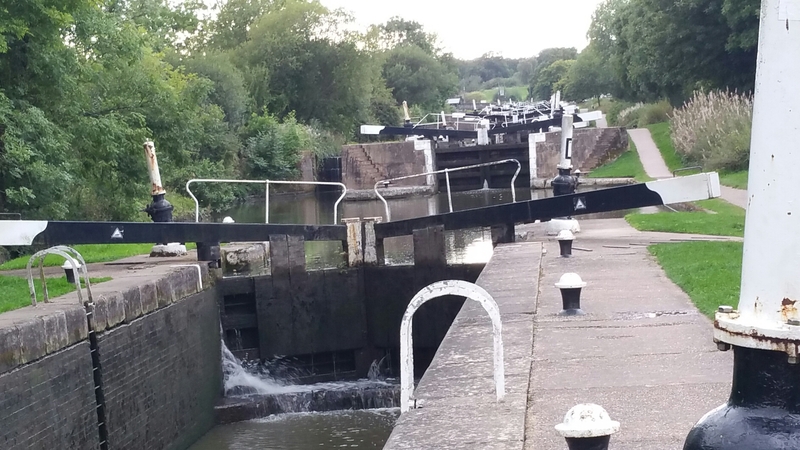 On our way back, a thin, bearded young man in ragged T shirt and baggy trousers paced and pranced round the concrete plinth of the first lock we had passed. He, accompanied on stage by a sack barrow with a rucksack strapped to it and a large plastic bottle of milk, was silhouetted against the setting sun delivering a rambling, angry soliloquy to himself. I had two thoughts simultaneously: what was his story; I hope he won’t be on our campsite later. I’m not proud of that. So tomorrow we continue east, through Leamington Spa and towards Northampton. The rain has started again and the forecast is for showers. As long as there are some sunny spells in which to charge the phone, we can cope with showers. Might need the Sleep Fairies to help me with the traffic noise here tonight though. Amazing journey Libby..keep it up! Lovely to read your progress here.